Total Church pleads for two key principles for church and mission. The gospel as content and the community as context. Total Church pleads for two key principles for church and mission. First, the gospel as content: being word centred (for the gospel is truth) and being mission centred (for the gospel is truth to be proclaimed). Secondly, the community as context: sharing our lives as Christians and offering a place of belonging to unbelievers. The authors apply these principles to church planting, evangelism, apologetics, social involvement, leadership, discipleship, pastoral care, world mission and notions of success. They critique current trends within the church: emerging church movements are strong on community but weak on truth, while conservative evangelicalism is strong on truth but weak on community. Their call is a call for the best of both. This is a timely and provocative book which deserves to be widely read and applied. An excellent book to give to your leaders. Radical, punchy teaching that provokes, stimulates, challenges and inspires. This is a book that scratches where I have been itching for so many years. Refreshing combination of solid biblical truth simply explained, with a fresh application. Timmis and Chester take what we all know and challenge us to actually put it into practice. This book should be required Reading for all church leaders. So a huge thank you to steve and tim for scratching where I itched. Top five best books I've ever read for sure! Having grown up in a "traditional" church situation I am now challenged with the nature of "church" because I am serving in a ministry context reaching out to people from a muslim background. I don't want for them what I had, however, but exactly what I read about in this book. My muslim background believer friends need and want real community as a living expression of their new identity in Jesus Christ. This book helped identify and correct a number of questions I have had as I have shared Jesus with people and worked to see them become a part of the "church." I'm on my third read-through and continue to find this book extremely useful. 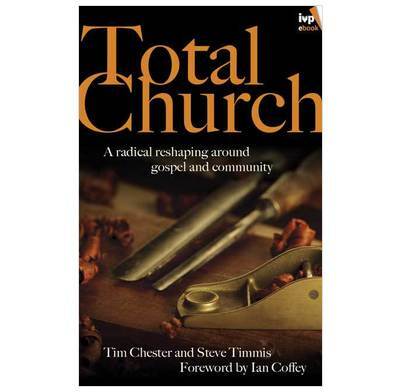 Timmis and Chester have thought hard about what church is, as described in the Bible, and find many current practices wanting. There are churches where the gospel is central but people are not deeply involved in one another's lives. Other churches value community but the Word of God is lacking. Timmis and Chester want both because the gospel word says that Jesus came to create a people (not a crowd) for himself. You will find in this book clear cross-centered theology applied to every aspect of a church's life. The authors show that a focus on community does not detract from the gospel but is in fact the vehicle that carries the gospel into the world. Read it! 'Total Church' is a refreshing look at what the Bible means to 'do church' It's greatest strength is in clearly articulating two underlying principles - namely, that church is about the gospel word and the gospel community - and then applying those principles in challenging and sometimes radical ways to issues that all churches face: evangelism, social involvement, mission, discipleship, pastoral care, etc. The authors are unafraid to challenge and upset cherished ideas and every chapter contains material designed to stimulate further thinking and action. This book should be mandatory reading for all church councils or PCCs and is highly recommended for all with an interest in seeing the church become all that it should be.